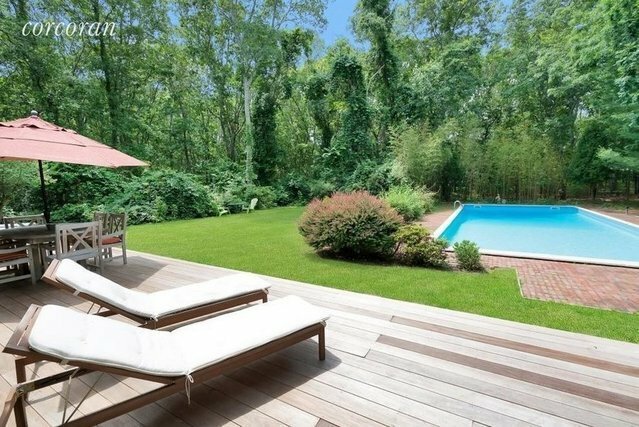 Rental Registration #: 18-383 This Hansom Hills East Hampton one level newly furnished contemporary with soaring ceilings is super close to East Hampton Village and the ocean beaches!!. Perfect for a family who enjoys the convenience and quiet peaceful surroundings. The house features four bedrooms, three marble bathrooms and a granite and stainless cook's kitchen with a professional Viking 6 burner stove.This marvelous East Hampton newly furnished home is available for Summer or year-round rental, complete with lush landscaping, an expansive deck, a 50-foot heated pool, central air conditioning and an outdoor shower. This is a perfect house for an ideal summer or year-round Hamptons retreat..